I always say to myself, “I’ll go into town for one thing” and come out with much heavier shopping bags (and a much lighter bank balance) than intended. Yesterday was no exception! The plan was to go shopping for a kid’s birthday present, and possibly stop by MAC to pick up a lipstick that Cherry Wallis has been loving. If I had time, maybe head to Boots for silver shampoo, and if I really had time to kill, maybe wander up to Forever 21, because I’d seen so many nice things when I was in last week. Various people liken the store to a candy shop – you go in and you want to buy every product in every colour and you never come out with just one product (unless you’re broke and very unfortunate). Originally I was on the lookout for this one particular lipstick (it’s called Impassioned, for anyone who’s interested). The problem with MAC is, there are so many shades that are incredibly similar. I couldn’t actually find the one I was looking for, but typically I couldn’t leave without one… So I opted for a daytime shade called See Sheer. I’ve never tried MAC lipstick before, but I’ve heard only good things, so I’ll post a photo up when I’ve tried it out. Another product I was thinking about is blush, probably cos i recently invested in a Real Techniques blush brush! 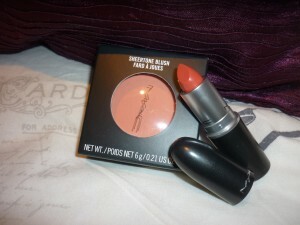 I have few different shades that I like, but again I’d never tried MAC and thought I’d give it a try. Lots of blush shades can end up looking quite harsh on my skin, so I went for a peachy tone (typically, called Peaches). It looks quite pink in the packaging but it’s not as harsh when in decent light! Again I think it’s ideal for a pretty daytime look. 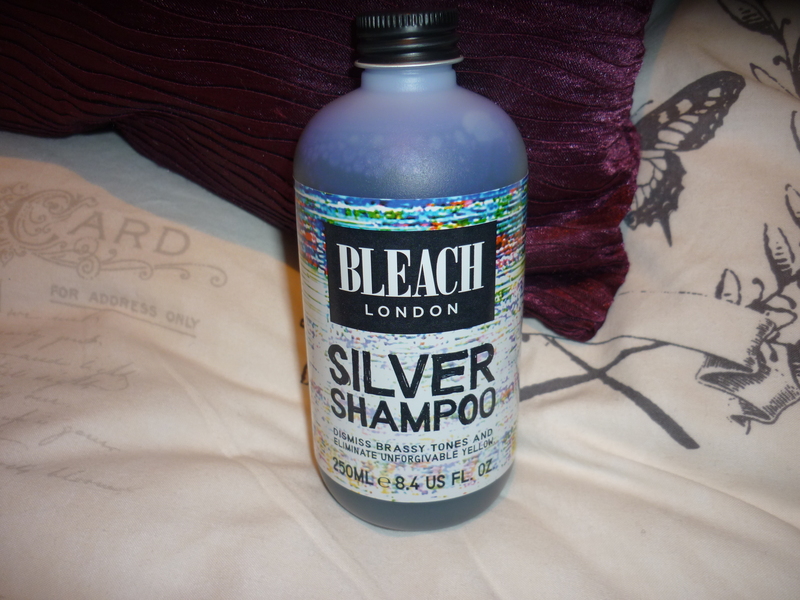 I went in with the intention of picking up some silver shampoo – I always go for the same one, but I decided to give the Bleach London brand a try (nothing to do with the fact that I’m seriously tempted to try out their pastel hair dyes…). I’ll let you know what I think once I’ve tried it! I had some time left before meeting my friend, so I wandered down the skincare aisles. Now, my skincare regime is incredibly basic. In fact, it just about exists and no more. I’m a massive fan of Simple products, because my skin is really quite sensitive and any perfumed or harsh products can cause absolute mayhem. Generally I just use a face wash or exfoliator, plus toner and moisturiser, but I’ve been watching a lot of beauty and skincare videos recently and everyone is swearing by eye creams. It’s not something I’ve ever considered buying before (after all, I look about 10 years younger than I actually am half the time) but I decided to take the plunge. Typical n00b, I had no idea what I was looking for. 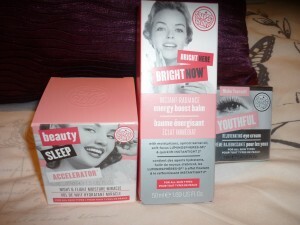 Soap & Glory to the rescue! They had a 3 for 2 offer on their facial skincare, so I walked out with the Beauty Sleep Accelerator night and flight cream (cos for some reason I’m starting to get paranoid about anti-ageing products and the fact that I don’t own any) plus the Make Yourself Youthful eye cream and the Bright Here Bright Now radiance booster. Again, I’ll post reviews once I’ve been using them for a while, but OMG the Beauty Sleep Accelerator smells amazing! Literally good enough to eat. It has Peach K and GoJuice extract, so it smells like a smoothie. "Really quick vlog and All Time Low!"